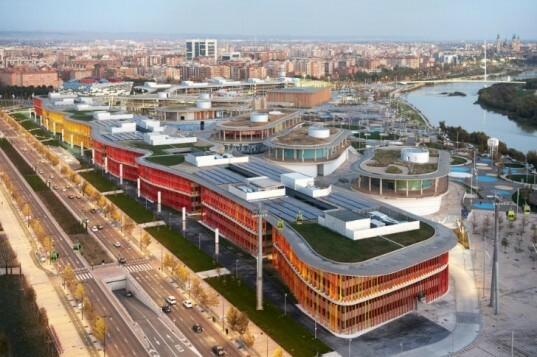 The Zaragoza International Expo took place in the summer of 2008 with the theme of "Water and Sustainable Development", and the area was designed to be transformed into a business park when the exposition was completed. So far a good portion of the renovation is now complete, and one of the main buildings has been turned into a colorful and sustainable office. Estudio Lamela is handling the "Ronda" building renovation, and they're respecting the proposal and philosophy the 2008 Expo by including as many sustainable building strategies as possible. Topped with green roofs and outfitted with bright vertical louvers, the office building makes excellent use of natural daylight and harvests solar energy with photovoltaic panels. The 2008 Expo in Zaragoza took place on the banks of the river Ebro. It was held during the summer and featured exhibits and events that focused on water and sustainable development. From the beginning, the expo developers envisioned that the buildings would be later used for as business park that would become an extension of the city’s downtown area. Estudio Lamela is in charge of the renovation and has already completed work on the long Ronda building. Work has begun on the Actur and Ebro buildings as well. 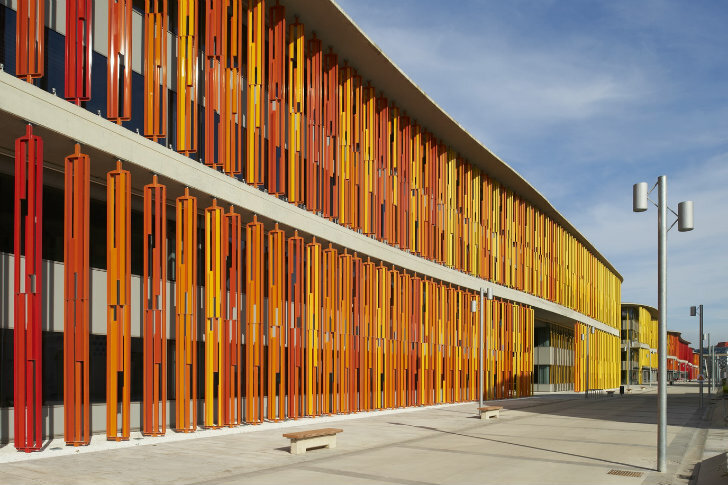 The curvilinear facade of the Ronda building has been outfitted with orange, yellow and red vertical louvers to protect the interior from glare and direct light. Skylights and light wells pull natural daylight into the interior of the building, and large overhanging roofs provide shade. Green roofs have been added to the top of the building to provide insulation and stormwater infiltration. Additional landscaping will help transform the hardscape area into a greener space. The Ronda building also includes solar photovoltaics incorporated onto its facade which provide additional shade. The interior of the international expo buildings have been reworked to accommodate flexible office space. The 2008 Expo in Zaragoza took place on the banks of the river Ebro. It was held during the summer and featured exhibits and events that focused on water and sustainable development. From the beginning, the expo developers envisioned that the buildings would be later used for as business park that would become an extension of the city's downtown area. Estudio Lamela is in charge of the renovation and has already completed work on the long Ronda building. Work has begun on the Actur and Ebro buildings as well. The curvilinear facade of the Ronda building has been outfitted with orange, yellow and red vertical louvers to protect the interior from glare and direct light. Skylights and light wells pull natural daylight into the interior of the building, and large overhanging roofs provide shade. Green roofs have been added to the top of the building to provide insulation and stormwater infiltration. Additional landscaping will help transform the hardscape area into a greener space. The Ronda building also includes solar photovoltaics incorporated onto its facade which provide additional shade. The interior of the international expo buildings have been reworked to accommodate flexible office space. Detail of the vertical louvers. Site plan of the new business park at Expo 2008 in Zaragoza Spain.